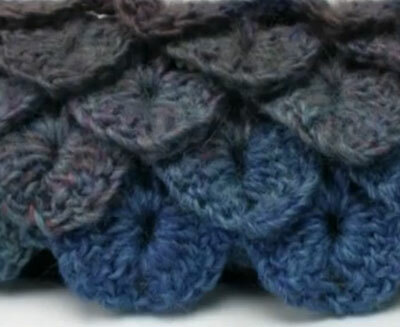 The Crocodile Stitch came abruptly onto the market in 2011 and quickly gained the hearts of crocheters globally. It is unique and fun. I created the Rio Scarf, to allow you to do something practical with your new found skills. So to keep this blog real in the sense of being bluntly honest. The one disadvantage to the Crocodile Stitch is that it tends to be a yarn pig. Meaning… it uses up a lot of yarn for the distance. If you see the Rio Scarf Pattern, there are 4 balls of yarn in that scarf. No big deal really for value or economy priced yarn. For higher end yarn, this scarf could topple up to and even over $50 easily in yarn costs. Not everyone wants to use cheap or economy yarn, so just be aware that the costs of the yarn are inflated due to the amount needed for this type of stitch. Otherwise, I love this stitch. It is cool and trendy! If you have never tried it before, there’s a tutorial below. Grab your crochet hook and some yarn and begin right now! This entry was posted in Advice & Tips and tagged Craft, Crochet, Crocodile Stitch, Fiber Arts, Knitting, Mikey, Pattern, Rio Scarf, Rio Scarf Pattern, Scarf, Shopping, The Crochet Crowd, Video Demonstration Below, Yarn. Bookmark the permalink. loved the tutorial it helped me soooo much. You truly are amazing at what you do…..Could really use the written instructions…. do you have written instructions for the crocodile crochet stitch? the tutorial was very informative & exciting. Pingback: I crochet too! | Life, and all it's majesty. Thanks for the video clip. I was wondering how it was done. You made it look so easy and now I have to remember how to do it for a later project. If I were you I’d try to learn it in a very twisted, light coloured cotton yarn. Once you master it, then switch to fluffy wool. Actually the tutorial would have been much clearer if he had used light-coloured cotton yarn, where every stitch is visible.